I think I must have eaten Thanksgiving dinner six times now. Leftovers fill my refrigerator. Ziploc bags of braised green beans with garlic, cornbread stuffing, turkey, glazed ham, and cranberry chutney stuff the shelves and Tupperware containers, filled of lone slices of pie and other remnants of Thanksgiving dinner, create Jenga-like stacks. Yet my calendar says it’s December and that means we are in the thick of the holidays with Christmas just around the corner. And, while the last thing I need is more sweets around my house, I couldn’t resist doing a little baking today. I did harness a bit of self-control and instead of buttery cookies garnished with sprinkles and icing, I opted for these fat-free meringue kisses. I’ve popped them into my mouth all afternoon so I’ve still over-indulged, but the fat-free thing has to count for something, right? Meringue is tricky. A little egg yolk in the whites or a greasy bowl and the egg whites won’t whip up. 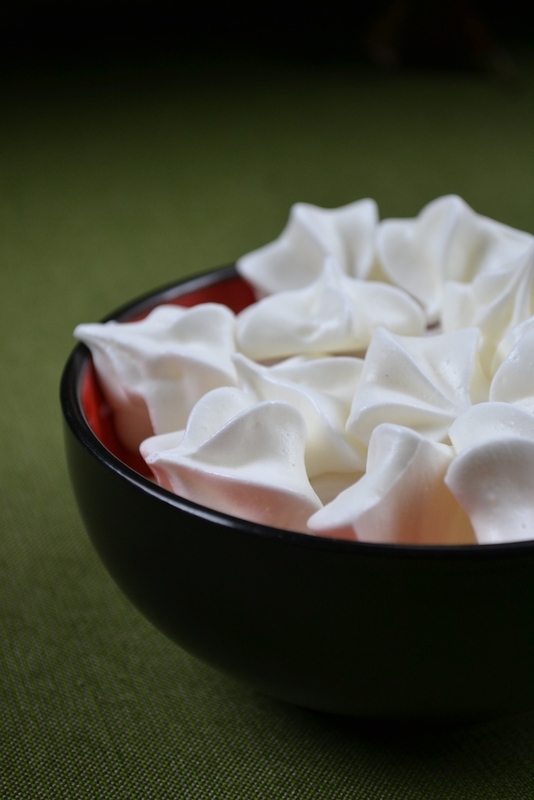 If it’s rainy or humid outside, the meringues struggle to get crisp. Too much heat in the oven, the outside of the meringue is brittle and brown while the inside is chewy. It’s enough to make one pull out a stick of butter and make some shortbread. But you shouldn’t do that. Pick a dry day to get in the kitchen and carefully separate the eggs before beating the whites in a metal bowl (avoid using a plastic bowl as it holds onto oils) to ensure they whip up appropriately. Pipe the kisses out small, to the size indicated, and bake as directed. And when the timer rings, turn off the oven and let them sit, in the oven, for AT LEAST 1 and preferably 1 1/2 hours. The result will be perfectly crisp, snow-white meringue kisses that will look great on a cookie tray – if you can get yourself to share them. And one last thing before you get baking. The process of filling piping bags with frosting or batter is enough to make even the most patient cook swear. There’s a trick however to fill your piping bag without the stress or mess. As the picture indicates, place the empty piping bag with the tip attached in a large cup and fold the top of the bag over the sides of the cup. Fill up the bag with the batter using a rubber spatula. Once full, pull up the sides of the bag and pipe. Happy holidays! Preheat the oven to 200 degrees and line two large baking sheets with parchment paper. Allow the egg whites to sit at room temperature for 30 minutes. 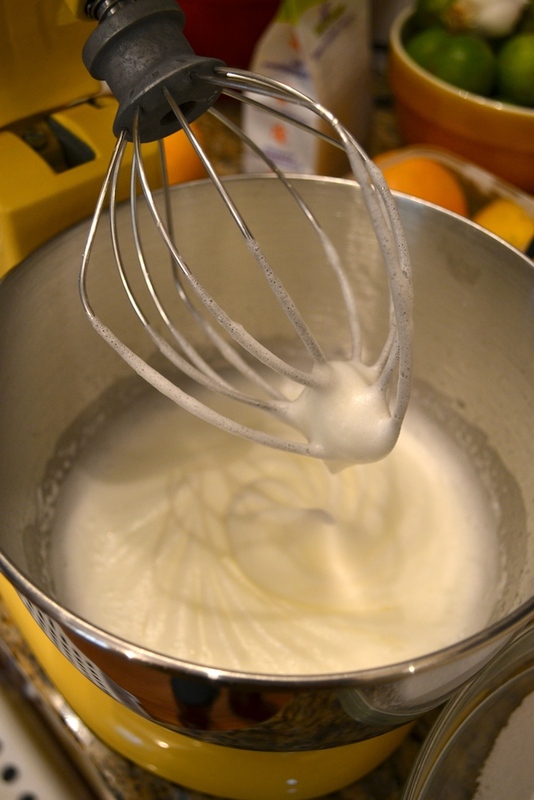 Add the eggs whites to the bowl of an electric mixer and beat with a whisk attachment until frothy. Add the cream of tartar and salt and beat on high speed until soft peaks form (when beater is removed tips of egg peaks will fold over). Sift the confectioners sugar and granulated sugar together in a large bowl. Add the sugar mixture in thirds to the beaten egg whites, beating well after each addition. Once all the sugar has been added, beat on high speed for 3 to 5 minutes until stiff peaks form and the egg white mixture is glossy and smooth. Add almond extract and beat until combined. Scoop the egg mixture into a piping bag fitted with a star tip and pipe out Hershey kiss-sized dollops* onto the parchment-lined baking sheet. Bake for 2 hours and 15 minutes. Turn off the oven, but don’t open it. Let the meringues cool in the oven for at least 1 hour and preferably 1 1/2 hours. 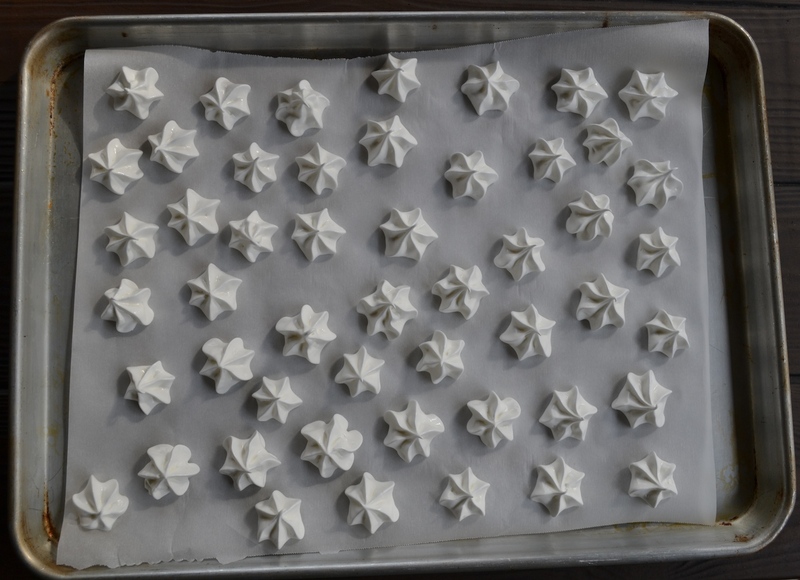 After this time, meringue kisses should be crisp all the way through and should easily release from the parchment paper. Remove the meringues from the oven and allow to completely cool before storing them, layered with wax paper, in an airtight container. Meringue kisses will keep for 3 days stored in this manner. 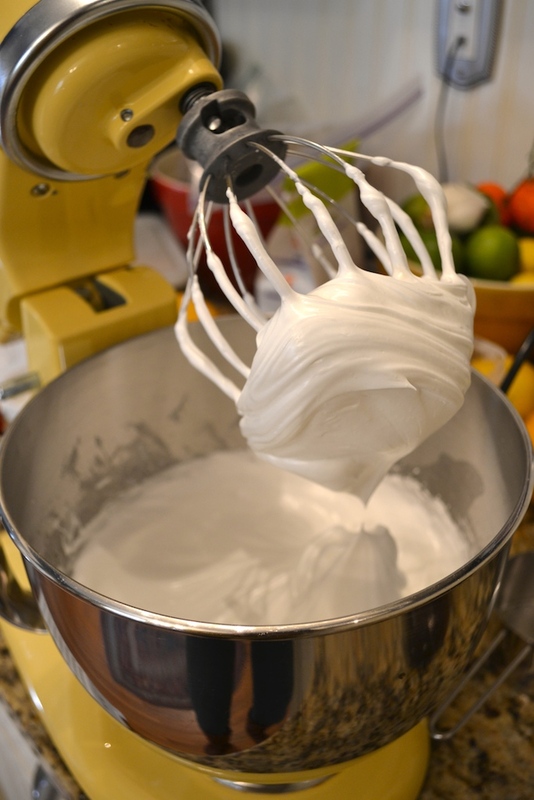 For longer storage, meringue kisses can be frozen. 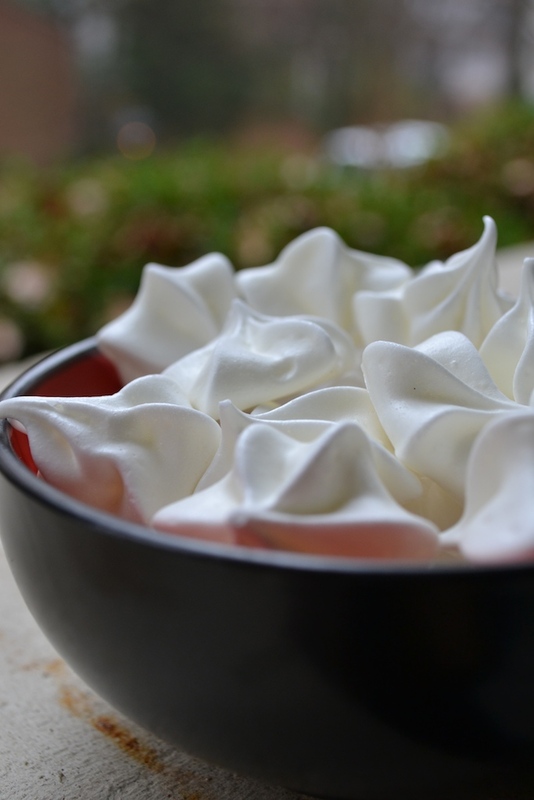 * Meringue kisses can be made larger, but they will require a longer baking time.